Detailed step-by-step instructions and lots of great tips for making delicious, smooth and creamy crustless keto cheesecake, sweetened with stevia. This wonderfully creamy crustless keto cheesecake is my husband’s favorite cake. He always loved cheesecakes and was sad to give them up when we transitioned to a low carb diet. Until we realized that it shouldn’t be too difficult to make a low carb, keto cheesecake, replacing the sugar with a low carb sweetener. What? I can eat cheesecake on the keto diet? Yes! Cheesecake is actually a recipe that can become keto pretty easily. My main challenge when creating this recipe for keto cheesecake was that I prefer to use stevia as a sweetener. Specifically stevia glycerite, which has no bitter aftertaste. I don’t use sugar alcohols anymore, because one of my teenage kids can’t handle them at all. And frankly, they don’t work too well for my own digestion either. The challenge with stevia is that sugar, and even sugar alcohols, add bulk and texture to baked goods. With stevia, you lose both. 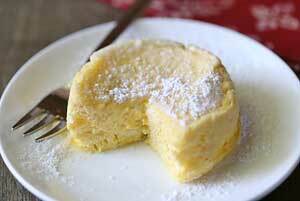 Still, this crustless keto cheesecake is truly wonderful. It’s actually one of those recipes where I don’t miss the sugar at all. But reduced fat dairy is not keto? I decided to make this low carb cheesecake without a crust, and using reduced fat cream cheese and light sour cream. The reason? Even on a low carb diet, I don’t like “spending” many calories on my desserts. I like the idea of cutting myself a BIG slice of this cheesecake (sometimes I divide it into 8 slices rather than 12! ), enjoying it immensely, and only “spending” 360 calories and 10g carbs on that huge slice. If you’re strictly following the keto diet and feel that reduced-fat ingredients have no place in a keto recipe, feel free to use full-fat products. But as far as texture and flavor go, I can assure you that the cake is marvelously delicious and creamy even with the lower fat ingredients. As for the crust, if you want one, the crust I used in this gluten free pumpkin pie is wonderful – you could probably replace the honey with a low carb sweetener. As I’m sure you know, baking a cheesecake, including keto cheesecake, has its challenges – mainly that cheesecakes tend to crack as they cool, and sometimes while they bake. Here are a few tips for preventing those unsightly cracks. Bake the cheesecake the day before you plan on serving it, and consider it an all-day affair – 2 hours for bringing the ingredients to room temperature, 1 hour for baking, 1 more hour for cooling the cake in the oven, and 2 hours for cooling it outside the oven. So 6 hours have passed before you can put the cake in the fridge! Then you need to refrigerate it overnight, and preferably for 24 hours. Cheesecakes are NOT quick recipes. Well, except for this keto microwave cheesecake, which is not true cheesecake but is very tasty and ready fast. This is a must! Some people leave the cold ingredients (eggs, cream cheese, sour cream) out of the fridge overnight, in a cool kitchen. I usually take them out of the fridge in the morning, a full 2 hours before I start mixing the cake. Overmixing will aerate the batter, which later on, as the cake cools and shrinks, can cause cracks. So beat the ingredients on the lowest speed, and add the eggs last, as they can add the most air to the batter. This will allow the edges of the keto cheesecake to easily pull away from the pan as the cake cools and shrinks. I think a water pan, placed on the bottom oven rack, is better than a water bath (placing the springform pan in a larger pan with hot water), because you eliminate the risk of water seeping into the cake, while still keeping the oven moist to help prevent the cake from drying out and cracking. Use the oven light to peek and judge as best as you can if the cake is ready. It’s best to slightly underbake than to overbake. An overbaked cheesecake will definitely crack and will be dry and mealy rather than creamy. If your oven is accurate, as a general guideline, you can turn the oven off after 60 minutes. However, if the center of the cake appears to still be liquid, add 10 more minutes. Bake your keto cheesecake at 300 degrees F. Turn the oven off as soon as the cake is done: the edges should be very light brown and slightly puffed, but the center should still be sunken, though not liquid. If you wait until the center is fully baked, the cake will end up overbaked and will crack for sure. Let it cool for a full hour in the oven, with its door ajar. Then 2 more hours on a cooling rack out of the oven. After the cake has cooled to room temperature, refrigerate it overnight, and ideally for 24 hours. What to do if the worst happens and your keto cheesecake does crack? The next day, after it’s been refrigerated, dip a dinner knife in warm water. Gently and repeatedly press near the crack until it closes. Then use the knife, again dipped in warm water, to smooth the top of the cake out. Here’s a good guide to fixing a cracked cheesecake. Or top your keto cheesecake! Cheesecake toppings were pretty much invented for the purpose of hiding these very common cracks, so that’s an option too – blueberry compote and strawberry compote are the perfect toppings for this keto cheesecake. Yes, cheesecakes are tricky, but they are worth it! Detailed step by step instructions and lots of great tips for making delicious, smooth and creamy crustless keto cheesecake, sweetened with stevia. Remove the refrigerated ingredients from the fridge at least 2 hours before you start mixing. They must be at room temperature. Preheat your oven to 300 degrees F. Boil a kettle of water, and pour the water into a 9 X 13-inch pan. Place the pan with the water on the lowest oven rack. Generously butter the sides and bottom of a 9-inch springform pan. Line the bottom with a circle of parchment paper, and butter the parchment too. Place the cream cheese in a large bowl. Using a handheld mixer set to the lowest speed, lightly beat the cream cheese until smooth. Add the sour cream (if it's at room temperature, there will be some liquid separation - add the liquid too), the vanilla and stevia. Mix just until incorporated. Add the eggs one by one, beating after each addition. Only beat for as long as it takes to get a smooth batter, then stop. Don't overmix. Pour the batter into the prepared pan. Smooth the top out with a spatula. Place the pan in the oven, on the middle rack, above the water pan. Bake, without opening the oven door, until edges are light brown and slightly puffed, and center is still sunken but not liquid, about 60 minutes. Turn the oven off, and leave the cake in the oven, with the oven door ajar, for one hour. Then remove the cake from the oven, place the pan on a cooling rack, and let the cake cool completely, about 2 more hours. When the cake is completely cool, gently run a knife around the rim of the pan to loosen the cake's edges from the pan. Loosely wrap the pan with cling wrap. Refrigerate the cake for at least 8 hours, and preferably 24 hours, before slicing and serving. 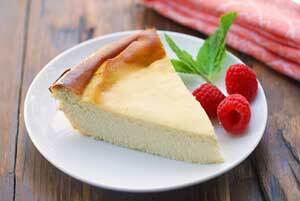 Remove the cheesecake from the fridge 30 minutes before you plan to serve it. When cutting the cheesecake, to prevent messy cheesecake slices, dip your knife in hot water and wipe it clean before each cut. Place leftover slices in sealed containers in the fridge, on paper towels to absorb extra moisture. Replace the paper towels daily. Remove leftovers from fridge 30 minutes before enjoying.